_______If you're looking for a large toy for your child for the holidays, the Teenage Mutant Ninja Turtles Secret Sewer Lair Playset is a great choice. This is perfect for anyone who is a fan of the Teenage Mutant Ninja Turtles cartoons. The most obvious feature of this set is its size - it's over forty-two inches tall! It's designed for children around the age of six years old, so it might even be bigger than your child. It has three different levels for play. The bottom level is, of course, the sewer. As you move up you get to the street level and then to a rooftop level. Because of its size, it has 20 features for playing with action figures. If your child is a fan of the Teenage Mutant Ninja Turtles, he'll be thrilled to play with this toy. The action figures for this set are sold separately, so you need to make sure that you purchase the Turtles and Shredder so that a battle can ensue. Some of the features include a zipline for the turtles to sail down from the highest level. It also includes floors that can fall out leaving a trap for action figures. It also includes a Shredder dummy so that the Teenage Mutant Ninja Turtles can practice fighting against him in their training. The Teenage Mutant Ninja Turtles Secret Sewer Lair Playset is designed to look just like the secret sewer lair on the television show. If your child is a fan, this is a great set that can be used to act out scenes from the show or develop his own storyline. Consumers rave about the size of the set. If you want to have something large to put around your Christmas tree for Christmas morning, you couldn't find a better toy. Your child's eyes will grow wide when he sees a toy as big as him. The other feature that parents love is how sturdy this set is. It's built to stand up to the wear and tear that children can place on toys. You won't have to worry about it falling apart the day he gets it. This toy is definitely built to last. Another thing you'll love about this toy is that batteries are not required. However, some assembly will be required so be prepared to spend some time putting this together on Christmas Eve. The time and effort will be well worth it when you make his Christmas morning special. 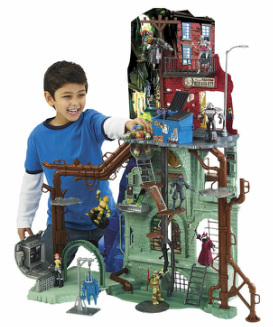 The Teenage Mutant Ninja Turtles Secret Sewer Lair Playset is a great choice for children who love the show and characters.